The campaign also includes the web video “Mr. Memory,” which went viral earlier this year and received 100s of thousands of hits on YouTube. The cleverest pet goldfish ever, Mr Memory, performs at his best with the help of Drench. The Stay Drenched YouTube channel includes goldfish quiz question videos. 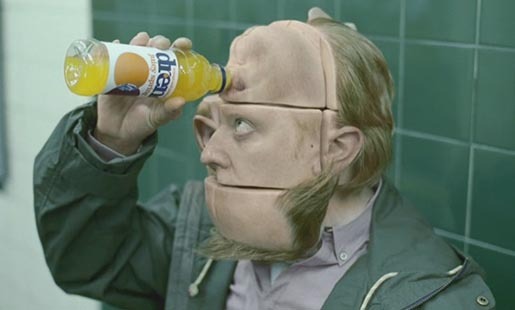 The Cubehead campaign was developed for Britvic at Clemmow, Hornby, Inge & Partners, London, by creative director Ewan Paterson, creatives Dave Masterman and Ed Edwards, and agency producer Kate Hardwick. Filming was shot by director Ulf Johansson at Smith & Jones Films, London, with director of photography Stephen Keith-Roach and producer Philippa Smith. Editor was John Smith at The Whitehouse, London, with producer Lisa Kenrick. Visual effects were produced at The Moving Picture Company, London, by VFX supervisor Matthew Unwin, VFX artists Michael Gregory, Jason Hayes, Lisa Ryan, VFX elements camera operator Tobie Lang, colorist Jean-Clement Soret and post produce Chris Allen. Audio post production was done at Wave Studios, London, by sound designer Parv Thind, and Dolby mixer Tony Rapaccioli.